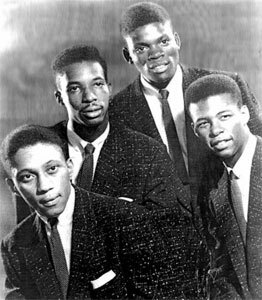 Groupe Doo Wop US d'Atlanta (Georgie) formé en 1949 et composé de Dodd Hicks, Henry Boyd, Ralph Riley et Romeo Shuler. Les Cashmeres ont enregistré aussi sous les noms de Marktones et Kashmirs. 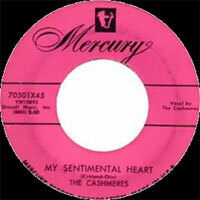 Atlanta R&B outfit the Cashmeres formed in 1949 -- according to Marv Goldberg's profile in the September 2004 issue of Blues & Rhythm, lead Dodd Hicks, tenor William Boyd, baritone Ralph Riley, and bass Bobby Arnold founded the group to participate in a talent show at their high school, McNeal Turner. After winning top honors in the contest, the Cashmeres decided to continue their collaboration, making a handful of appearances at Atlanta teen clubs clad in the cashmere sweaters that were their trademark. As their live schedule expanded, however, the parents of Boyd and Arnold balked, and they were forced to resign. 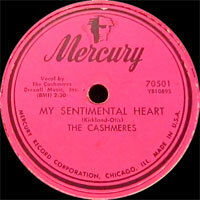 Tenor Henry Boyd and bass Romeo Shuler, Jr. were quickly recruited to pick up the slack, and with the aid of manager Mark Allan, a radio personality with Atlanta station WAOK, the reconstituted Cashmeres cut a demo session for Mercury Records -- the label extended a contract offer, and in October 1954 the group traveled to New York City to record its debut single, "My Sentimental Heart." 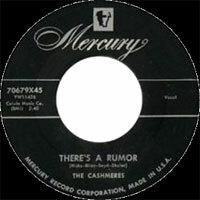 Although the single earned significant airplay in Atlanta, it failed to catch on nationally, and in April 1955 Mercury issued the follow-up, "Don't Let It Happen Again" -- when it too earned little notice at radio or retail, Mercury released one more Cashmeres single, "There's a Rumor," before terminating the group's contract. 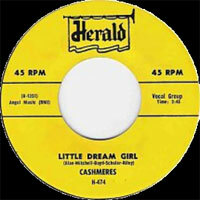 A frustrated Hicks enlisted in the U.S. Air Force at year's end, and the remaining trio added lead Grover Mitchell, signing to the Herald label to release "Little Dream Girl" in mid-1956. The single quickly disappeared, and the group dissolved soon after. 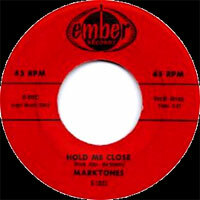 In the summer of 1957, Herald's Ember subsidiary issued "Hold It Close," credited to the heretofore unknown Marktones -- in truth, the song was an unreleased leftover from the Cashmeres' "Little Dream Girl" session of a year earlier. Six months later, Hicks returned from military service and with Henry Boyd formed a new Cashmeres lineup with tenor Langston George and Edward Patten, both on hiatus from their duties as Gladys Knight's Pips -- when Knight's "Whistle My Love" became a hit in early 1958, George and Patten quickly ankled the Cashmeres to reunite with the singer, forcing Hicks and Boyd to convince Ralph Riley to come out of retirement. He eventually assented, but Romeo Shuler wanted no part of the revived Cashmeres -- neighborhood friend Norman Lumpkin finally agreed to handle bass duties, and in the summer of 1958 the new lineup cut "Heaven Only Knows" for the NRC Records imprint. Credited to the Kashmirs, the single fell on deaf ears and after one last gasp, the 1959 ACA release "Stairsteps to Heaven," the group split once and for all. Hicks later resurfaced as a solo act, adopting the alias Dobie Hicks for his lone Vee-Jay effort, 1961's "Where Is She" -- he continued touring the Atlanta club circuit until finally retiring in the late '80s. 11/1954 SP Mercury 70501X45 (US) . 05/1955 SP Mercury 70617X45 (US) . 09/1955 SP Mercury 70679X45 (US) . 04/1956 SP Herald H-474 (US) . 08/1957 SP EMBER 1022 (US) . 08/1958 SP WONDER 104 (US) .